This will continue until March with their continued purchase of mortgages and treasury bonds. We are told by Berananke that in March it will stop and he will begin his "exit strategy" to remove the wall of money from the system. No financial experts have been able to figure out how this will be possible with the deficit projected at $2 trillion this year and no other buyers available for mortgages. Or maybe there is no exit strategy. Morgan Stanley and Goldman Sacs, two of what has been referred to recently as the banking criminal syndicate, reported earnings this week and decided to share the details of the compensation for their employees as well. The average pay for the year at Goldman Sacs came in at $498,153. They crushed all previous annual bonus records in 2009. Morgan Stanley reported a 2009 profit of $1.15 billion and paid out $14.4 billion in bonuses to its employees. They paid out 62% of total revenue in bonuses. They also broke all bonus records in 2009. As I have discussed, these firms have borrowed over $1 trillion from the Federal Reserve at 0% interest. They have used that money to massively leverage back into risky bets and pay enormous bonuses. The emergency unemployment numbers this morning came in at astounding record highs once again. 1 out of 8 Americans and 1 out of 4 American children are currently on food stamps. A lady I work with in my office lost a good friend of her family's last night. She gave her only son his name. He took his life yesterday because of the current economic hardship he has been facing with his inability to find work. I would look for the anger and the tea parties to grow as we move forward. I would also be very nervous if I was a banking executive in New York City. I see the possibility of child kidnappings, similar to what you see in Mexico City, as a major problem in the future. My focus on this site, which has most likely become obvious at this point, is to show that the problems in the housing and financial sector during the fall of 2008 were picked up and put on the backs of governments around the world. Essentially, governments have nationalized the problems. My focus since the fall of 2008 when this occurred has been to repeatedly state that this was not a cure to the problem, but would only ultimately lead to the next crisis. 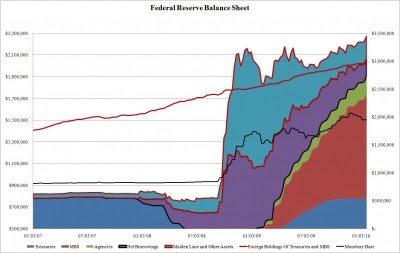 For over a year now that problem has grown, getting worse every month as governments go deeper into debt to try and mask financial losses, artificially supporting their economies with temporary demand, and printing currency to cover what they cannot borrow. Now we are starting to finally begin to feel the system shake once again, just as we did during the summer of 2008 when people began to worry about the debt at Fannie Mae, the credit at AIG, and the reserves at Lehman brothers. Just as they were during that summer, the big boy hedge funds are placing their bets to profit from the next catastrophe. The European Central Bank has recently met with attorneys to discuss plans should Greece default on their debt. While Greece can be removed from the Eurozone (and thus the Euro currency), many experts feel that their default would be a first domino, triggering defaults in the "PIGS" countries; Portugal, Ireland, Greece, and Spain. All these nations are currently facing funding issues. The same is happening outside of the Eurozone in Japan and the United Kingdom. The debt levels in these countries have approached unsustainable levels when compared to their GDP (the size of their economies). They would be the next domino in the chain to fall. Back home here in the USA, however, we have an even larger problem. Our entire economy from top to bottom has been put on government life support. Our government currently owes $13 trillion and they are proposing to raise the debt ceiling another $1.9 trillion just for this calendar year. The American public as a whole last year were net sellers in the stock market. They then took their money and dove into the bond market, contributing over $350 billion in the fourth quarter alone. The public today feels that bonds are as good as cash only they provide a higher return. If investors begin selling government bonds then interest rates will rise and the value of the bonds will drop. Investors today are sitting in the "safety" of government bonds looking around to try and figure out where the next bubble is going to burst, just as they did a few years ago when they bought into the safety of real estate after the stock market bubble. Unfortunately, they do not realize they are already sitting in the bubble and as they look around for their next move it is going to explode along with their retirement.